The past week or so has been a bit of a whirlwind. I got sick, for starters. Don’t ask me how. How does one come down with a cold in the summer? It defies logic (even though, the biology student side of me is chiding me for thinking that a ‘cold’ has anything to do with actually being cold). I had a really good last week at work. They’d finally hired someone (who was actually recommended by me) to fill the empty position and to, well, replace me! So I had 10 days to train her, get her up to speed. Luckily all the little things that she needs to be able to do on her own after I’m gone from there came up so she got a chance to watch me do one and then do one herself. Tuesday (30th), two of the salesmen treated me for lunch (got permission to take me out and everything). They joked about how I was going on a ‘double date’ and how when I go and retell the story to my friends at school, I’ll be making them both at least 20 years younger. It was good though, I did like the sushi! I was feeling a little bit under the weather by Wednesday but overall still pretty okay. I kept on ‘catching’ people writing in a card. It’s pretty obvious when they were because another person had left to relocate (still working for the company though) and the card was transferred from office to office via a plain manila folder. It’s easy to tell because they keep on reusing the same folder and someone saw me and quickly closed it. Yeah, I knew what they were doing. Thursday my voice was half-gone, but still useable (heh, useful for answering phones). The fire alarm was pulled Thursday morning though, and there had been a fire at work. A normal fire is worrisome as it is, but an industrial fire is very worrisome considering the chemicals and the type of company that I work for. The smoke that was going up into the air was pitch black at some instances and then (due to what was burning) yellow later. With my stuffed up nose, I couldn’t smell it but I knew (from experience) that it was disgusting. My primary concern was smoke inhalation for my coworkers that were closer to the fire. First thing I had said to the VP when I saw him after the fire was put out and we were back in the building “How are you feeling? Did you get checked for smoke inhalation?”. My coworkers surprised me with a small pizza party (how sweet!) and they gave me the card that a lot of people had written really nice things in along with (!) a company jacket (it’s a little big on me, and I’m not going to grow into it like one of my coworkers had said) and a gift card to Staples (I jokingly said that I’d be using it to buy nice pens for school – which I ended up doing on Saturday). It was fun though, everyone cracked jokes about me. I think even though everyone that was there said that they expected to see me back next year, I think they also know that there’s a smaller possibility of that now that my graduation is slated for next spring/summer. Obviously, I’d have to see – but I don’t know. That company has been my summer ‘home’ for the last six summers. They’ve watched me grow into the person that I am now. And it’s comforting to know that it’s there and they want me back, but at the same time… That company is the only company I’ve worked for, despite their change in name. At one point, someone commented how when I first started (2006), I wouldn’t talk to anyone and then (and several people said this) “Now we just can’t get you to shut up!”. They kid, mostly. I am a bit more talkative now, but I’ve also grown out of being as shy now, at least I hope so! Friday was a very relaxing work day, despite my coughing fits. I went out for dim sum with three other salesguys as they wanted to treat me out for lunch. I got the pleasure of ordering and they were a little concerned (while they’d all been to dim sum before, they never went with someone who really ‘knows’ the dishes well). I ordered a few things that none of them had ordered before – luckily they all enjoyed it! Work went well, hugs were exchanged. I handed out a few gifts (hat for E’s daughter – as promised by a little work bet; baby hat for unborn baby boy for C’s future offspring; some small gifts for the girls that I’d worked with all summer long) and got a few more gifts in return (t-shirt, in men’s Large…?, that’s a company shirt; E got me a good-bye card and super cute pink cat stuffie, picked out by his daughter). Friday night I was just awful. I ran a fever up to 102F and ended up mildly delirious (according to my sisters). We had no Tylenol or any other medication for fevers in the house so they had to run to the pharmacy to get some for me. I was cold (but hot at the same time) and ended up going to bed at around 9pm that night. I woke up Saturday feeling a lot better but still with a fever of 100F. It’s amazing what 2 degrees lower will do for a person. I was fever-free by mid-afternoon. I went out with my family for lunch, went grocery shopping, I also bought new pens from Staples for school (thank you, work). Today, I feel a lot better thankfully! I’d been doing a bit of cleaning and getting things ready. My backpack is all ready for my first day of classes (well, all I put in was some paper, a clipboard, pens and a chocolate bar – what else does a student need?). 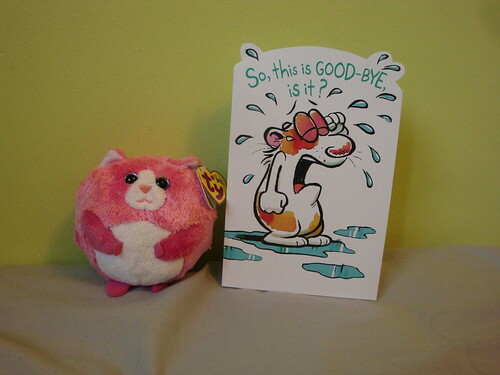 Aww it sounds like your coworkers were really sad to see you go. 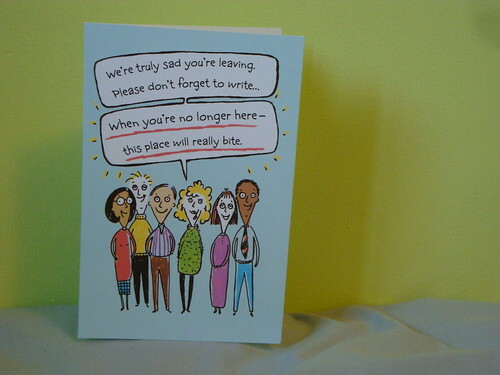 That was really nice of them to make the end of work memorable for you hehe! I’m sorry you got so sick! I’m glad you are feeling better, though! I hope the start of school goes so well for you! I look forward to hearing all about it! Stay healthy until then! I missed my coworkers too 🙂 They’re nice people overall. Plus, hey, I have a new jacket that works well in the rain.